Chennai, Mar 11: Kollywood actor Vishal Krishna was injured on Saturday while shooting a Tamil version of the Telugu hit song Blockbuster from the Allu Arjun starrer. 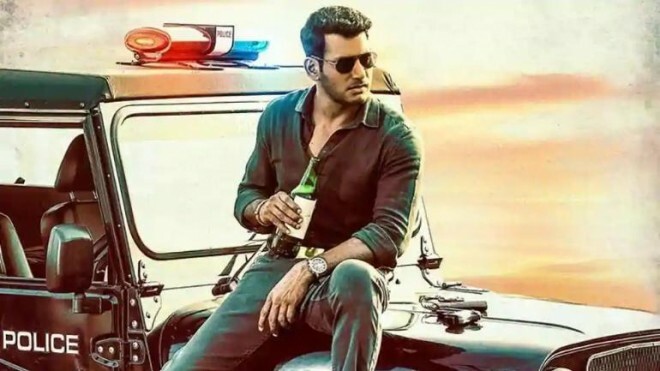 Vishal is currently shooting for Ayogya a Tamil version of the Telugu hit Temper. He plays the role of a short-tempered vigilante. The same film was recently made in Hindi, Simmba, with Ranveer Singh in the lead. Vishal and his director Venkat Mohan decided to integrate into Ayogya the big hit song Blockbuster from the Allu Arjun Telugu hit 'Sarrainodu'. Nursing an injured foot and inflated elbow Vishal says, "It was a freak accident. I slipped and fell when we were shooting a Tamil version of the song Blockbuster. I have a twisted ankle and a swollen elbow as an instant legacy of my dancing skills." The shooting has come to a halt until Vishal is dancing-fit again. This athletic actor is no stranger to on-location injuries. While shooting for the Tamil film Poojai in 2013 Vishal fractured his hand. Then again in 2014, while shooting for the Tamil film Aambala, he tore a tangle during a fight sequence. "Such wear and tear is a part and parcel of an actor's life. If you want to remain relatively safe then go for a desk job," says Vishal.